Professor Vaidya is a Professor of Surgery and Oncology and Consultant Surgeon specialising in the diagnosis and treatment of diseases of the breast. He currently divides his time equally between research and clinical work. He has over 200 original scientific publications in a wide range of medical fields. His main research aim over the past twenty years has been to improve our understanding and treatment of breast cancer. He has been invited to contribute to several books on breast cancer. The latest edition of his book “Fast Facts – Breast Cancer” was released in June 2014 and is available as paperback, Kindle and eBook editions. He has been featured in Time magazine and Reader’s Digest and is regularly invited to speak on the BBC. He works as a Consultant Surgeon in London at the Whittington, Royal Free and University College London Hospitals, and sees private patients at the London Breast Institute at the Princess Grace Hospital and King Edward VII’s Hospital. 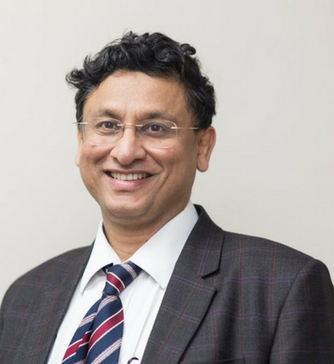 He has experience in all aspects of breast cancer surgery including lumpectomy, wide local excision and quadrantectomy for breast cancer including glandular reconstruction, sentinel node biopsy / axillary sampling, axillary clearance, and targeted intraoperative radiotherapy, – Intrabeam TARGIT IORT – a particular type of IORT. He works in conjunction with renowned plastic surgeons for breast reconstructive surgery. They take a multidisciplinary approach to breast cancer treatment and work very closely in a renowned team of medical oncologists, radiotherapists, radiologists and pathologists, breast care nurses, and specialists in psycho-social care.